NGC 6820 is an emission nebula that lies approximately 6000 light years away in the Orion arm of the Milky way (the same arm in which our solar system resides). It contains many Bok Globules. These small, dark regions of gas and dust are in the process of star-formation. The trunk-like structure is likely formed by stellar winds of newly formed stars. 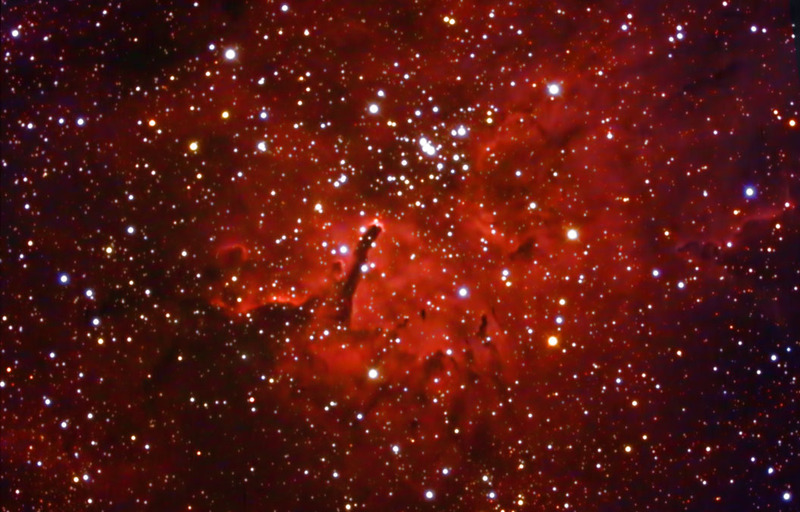 This nebula is associated with the open star cluster NGC 6823 (located at the upper center). Color images were focused using the camera's live view. They were calibrated, aligned, and combined in ImagesPlus. Ha images were focused, acquired, calibrated, alignged, and combined in CCDSoft. The combined color and Ha images were aligned in Registar. The composite image created and adjusted in Photoshop. Topaz Detail and DeNoise were applied. Taken from my backyard observatory in southeastern Minnesota on 8/2115 and 8/22/15.